Download "Revenue increase of 21% in the first half of 2015"
1 Press release: 2015 First Half Results Igny, August 7, 2015 First half results of 2015 Consolidated Profit & Loss (in M) Revenue increase of 21% in the first half of 2015 From January 1, 2015 to June 30, 2015 From January 1, 2015 to June 30, 2015 Revenue % Gross Margin % Gross Margin as % of revenue 13,2% 18,2% Var (in M) Operating Expenses % Operating income % Non recurring charges 0.1 0,0 0.1 N/A Financial income N/A Income tax N/A Net consolidated income % * 2014: includes Logic Instrument's sales starting 01/23/2014, acquisition date of ARCHOS in the company Var % Revenue for the first half of 2015 was recorded at 69.1 million, an increase of 21% from the same period in Revenue for the first half of 2015 Revenue in M S S Var in M Var in % Europe % Rest of the world % Logic Instrument* % TOTAL % * 2014: includes Logic Instrument's sales starting 01/23/2014, acquisition date of ARCHOS in the company This increase is largely due to: A proven success in Africa and the Middle East on the horizon ARCHOS, by way of its Egyptian partner, has been met with success in Africa. 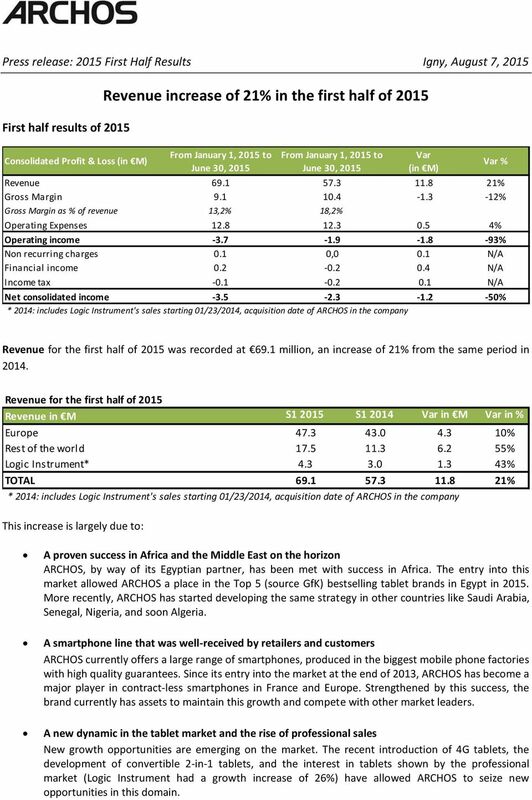 The entry into this market allowed ARCHOS a place in the Top 5 (source GfK) bestselling tablet brands in Egypt in More recently, ARCHOS has started developing the same strategy in other countries like Saudi Arabia, Senegal, Nigeria, and soon Algeria. A smartphone line that was well-received by retailers and customers ARCHOS currently offers a large range of smartphones, produced in the biggest mobile phone factories with high quality guarantees. 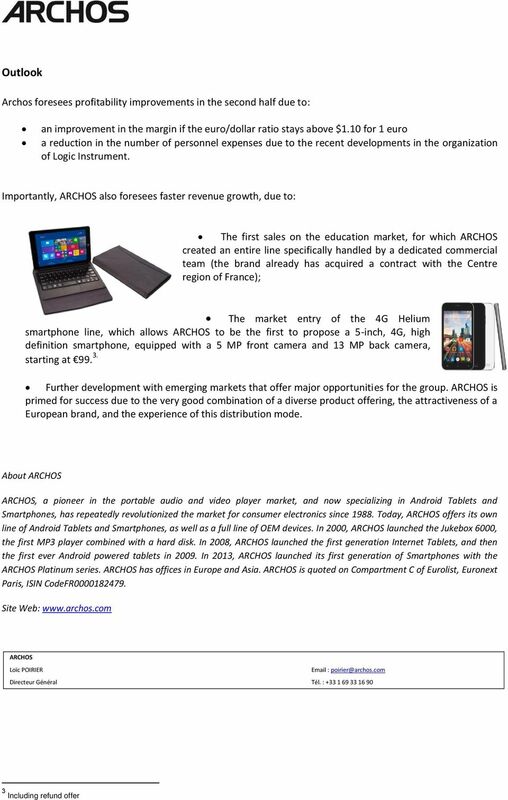 Since its entry into the market at the end of 2013, ARCHOS has become a major player in contract-less smartphones in France and Europe. Strengthened by this success, the brand currently has assets to maintain this growth and compete with other market leaders. A new dynamic in the tablet market and the rise of professional sales New growth opportunities are emerging on the market. The recent introduction of 4G tablets, the development of convertible 2-in-1 tablets, and the interest in tablets shown by the professional market (Logic Instrument had a growth increase of 26%) have allowed ARCHOS to seize new opportunities in this domain. 3 year, the 2012 CIR of 2 million was recorded in other current assets, and the 2010 CIR was reimbursed by the Administration in January Consolidated net stock remained stable at 28.3 million. Trade receivables are lower as of June 30, 2015, than they were at December 31, ARCHOS generally records higher sales volume in the later months of the year. Other current assets represent 13.7 million, a loss of 2.2 million. They are mainly comprised of: The 2011 and 2012 CIR with a due date below one year, representing 3.7 million; Supplier advances representing 5.6 million, a major decrease compared to December 31, 2014, which has seasonal causes. The current assets of LOGIC INSTRUMENT do not vary and are of little significance. The equity of the group is impacted by several elements: During the first quarter of 2015, ARCHOS recorded an equity raise of 1.8 million, fully acquired by the leadership and management. 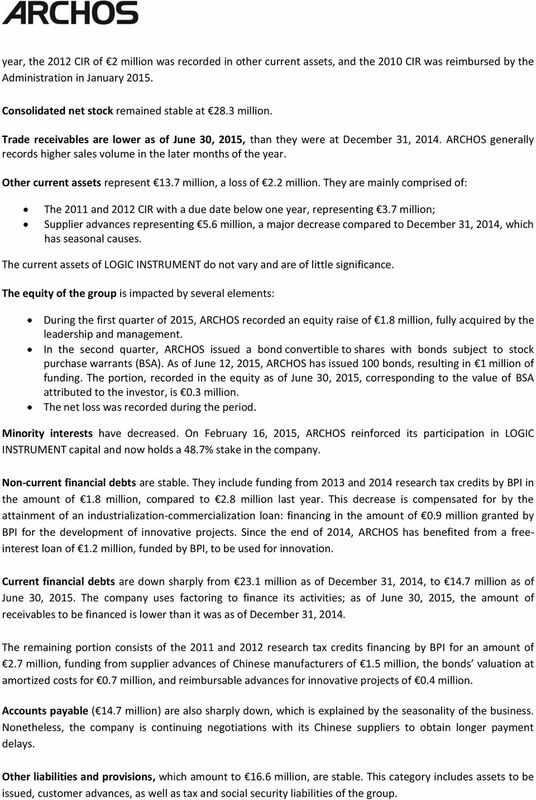 In the second quarter, ARCHOS issued a bond convertible to shares with bonds subject to stock purchase warrants (BSA). As of June 12, 2015, ARCHOS has issued 100 bonds, resulting in 1 million of funding. The portion, recorded in the equity as of June 30, 2015, corresponding to the value of BSA attributed to the investor, is 0.3 million. The net loss was recorded during the period. Minority interests have decreased. 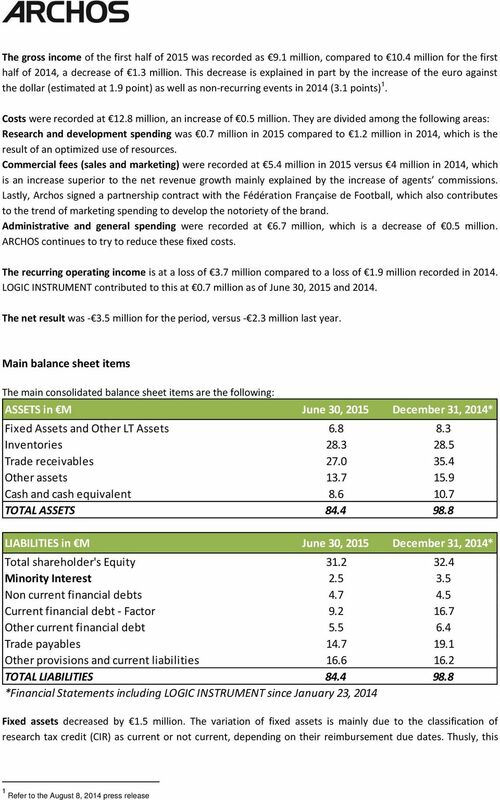 On February 16, 2015, ARCHOS reinforced its participation in LOGIC INSTRUMENT capital and now holds a 48.7% stake in the company. Non-current financial debts are stable. They include funding from 2013 and 2014 research tax credits by BPI in the amount of 1.8 million, compared to 2.8 million last year. This decrease is compensated for by the attainment of an industrialization-commercialization loan: financing in the amount of 0.9 million granted by BPI for the development of innovative projects. Since the end of 2014, ARCHOS has benefited from a freeinterest loan of 1.2 million, funded by BPI, to be used for innovation. 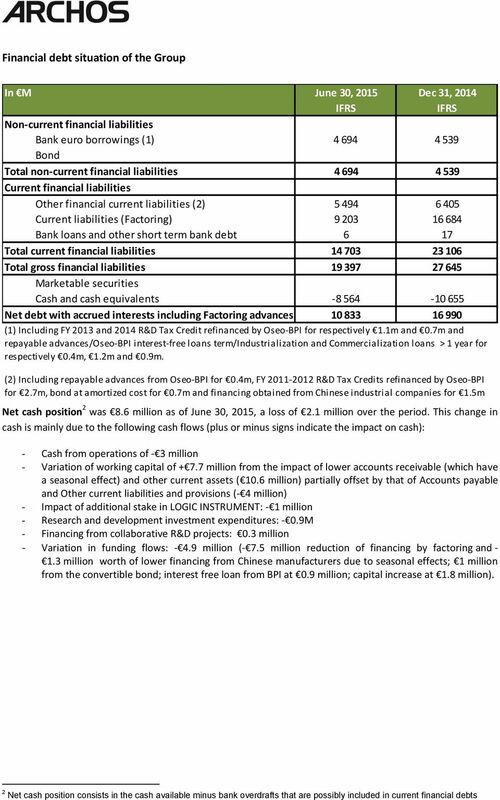 Current financial debts are down sharply from 23.1 million as of December 31, 2014, to 14.7 million as of June 30, The company uses factoring to finance its activities; as of June 30, 2015, the amount of receivables to be financed is lower than it was as of December 31, The remaining portion consists of the 2011 and 2012 research tax credits financing by BPI for an amount of 2.7 million, funding from supplier advances of Chinese manufacturers of 1.5 million, the bonds valuation at amortized costs for 0.7 million, and reimbursable advances for innovative projects of 0.4 million. Accounts payable ( 14.7 million) are also sharply down, which is explained by the seasonality of the business. Nonetheless, the company is continuing negotiations with its Chinese suppliers to obtain longer payment delays. Other liabilities and provisions, which amount to 16.6 million, are stable. This category includes assets to be issued, customer advances, as well as tax and social security liabilities of the group. 1 LANDI RENZO SPA 2015. Article Accounting Terminology Contents Page 1. Accounting Period... 4 2. Accounts Payable (Sundry Creditors)... 4 3. Accounts Receivable (Sundry Debtors)... 4 4. Assets... 4 5. Benchmarks... 4 6. B.O.S. The order and purchase backlog of the Group as of September 30, 2015 amounted to USD 10,219 thousand.